At NetherBox, we're proud to be releasing a brand new feature exclusive to our control panel. In this article, we'll provide step by step detailed instructions on how to use your own custom .phar file rather than the one we provide by default. This is a very simple process and can be completed in a few steps without the need of any external programs. All of this can be handled all through our control panel. 1. Contact our support department requesting for custom phar support to be enabled on your server. 2. You will need to find a custom .phar you want to use. At the moment, we ship all servers by default using the PocketMine-MP software. Many clients prefer to use a different .phar for multiple reasons. Important: The custom .phar you find must be a PHP7 compatible .phar. For MCPE .jar support (such as Nukkit), you must contact our support team to set this up for you. 4. With the file properly named, go to the server page in your control panel and stop your server using the "Stop" button. When the server is properly stopped, under the "JAR File" drop-down option, select "Custom PHAR (PHP7)". 4. With this option selected, log into the FTP portion of the server under Files -> FTP File Access. The password to log into FTP is the same password you use to log into Multicraft. When you have logged into FTP, you will need to click the "Upload" button on the left-hand side of the page. 5. 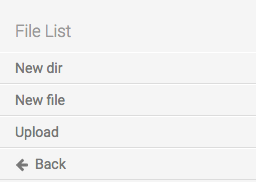 On the upload page, using the "Choose File" button all the way to the left-most side, find and select the custom7.phar file from step 2. 6. When this file is uploaded, you can return to the main page of your server control panel. With this file in place, click the "Start" button on the panel page, and your server should boot right up using the custom7.phar file you uploaded. In 6 steps, you're all done and running a custom .phar of your choice with NetherBox. If you have any questions or face any issues/difficulties throughout the process, please contact our support team by clicking here and we will be able to assist you in getting your custom .phar uploaded and running on the server. NOTE: You must purchase the "Extended Support" package in addition to your server for our customer support team to be able to assist with this issue. This is a small monthly fee and can be canceled.